Royal Canin wet food in pouches is an ideal supplement to Royal Canin dry food. It is based on the same philosophy as all other Royal Canin innovations: It is all about your pet's wellbeing. The recipes with tender chunks of meat in a delicious gravy are specially formulated to match the nutrient profile of your cat. The portioned pouches keep the food fresh and tasty. 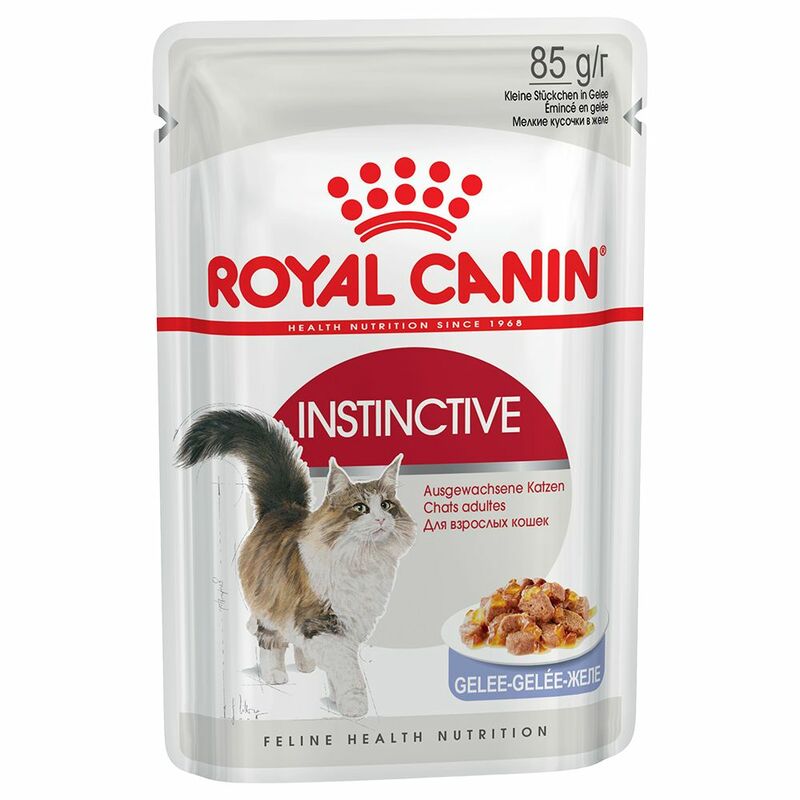 Royal Canin Instinctive in Gravy or in Jelly This food has been perfectly formulated to match the optimal Macro Nutrient Profile (ONP) instinctively preferred by adult cats over 1 year old. Royal Canin Intense Beauty in Gravy or in Jelly Nourishes the hair and helps maintain a shiny coat thanks to an increased level of omega 3 and 6 fatty acids, B vitamins, biotin and zinc. Royal Canin Sterilised in Gravy or in Jelly cat food for adult, castrated cats over 1 year old, promotes a healthy urinary tract by reducing the concentration of minerals which can lead to the development of urinary stones. Royal Canin Ultra Light in Gravy or in Jelly Helps control bodyweight and to reduce spontaneous calorie intake in adult cats. L-carnitine helps the body utilise fat stores. Royal Canin Digest Sensitive in Gravy provides the ideal formula for cats with dietary sensitivities: supports and aids digestion with reduced stool odour. Royal Canin Urinary Care in Gravy supports your cat's urinary tract health and helps with maintenance of an ideal weight. Royal Canin Hairball Care in Gravy supports the natural expulsion of swallowed hair and promotes a healthy digestive system, as well as helping with weight maintenance. Royal Canin Kitten Instinctive in Gravy or in Jelly is small tender chunks which have been perfectly formulated to match the optimal Macro Nutrient Profile instinctively preferred by 2nd age kittens (4-12 months). Also suitable for gestating cats. Royal Canin Oral Mature in Gravy or in Jelly Oral Mature tender chunks in gravy make it poΒible for older cats (over 10 years) with sensitive teeth and gums to continue eating normally. Aids good kidney health and joint function. Royal Canin Ageing plus12 in Gravy or in Jelly cat food offers an ideal formula of ingredients of senior cats over 12 years old. The entire product line has been formulated to match the optimal Macro Nutrient Profile (MNP) for your cat. Instinctive has been perfectly formulated to match the optimal Macro Nutrient Profile instinctively preferred by cats at each individual stage of their lives. The optimal Macro Nutrient Profile is the goodneΒ which your cat derives from the various nutrients. It is the optimal balance of proteins, fats and carbohydrates with long-term acceptance, based on your cat's age. The specific nutrient profile will vary with the age of your cat, but also with its physiological status (gestation etc.) Cats know which nutrient profile is most suited to them and choose their food accordingly. The Optimal Macro Nutrient Profile is drawn from Royal Canin's years of experience. It will keep your..